When many contemporary builders equip their handcrafted high-end instruments with active electronics, Veillette Guitars has gone back to basics with a passive Retro version of its Modern Singlecut (reviewed in June 03). 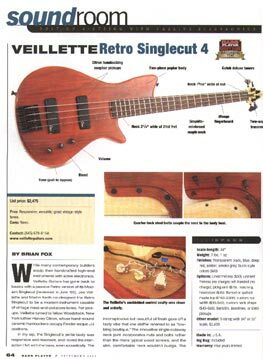 Joe Veillette and Martin Keith co-designed the Retro Singlecut to be a modern instrument capable of vintage meat-and-potatoes tones. For pickups. Veillette turned to fellow Woodstock, New York luthier Harvey Citron, whose hand-wound ceramic humbuckers occupy Fender-esque J/J positions. 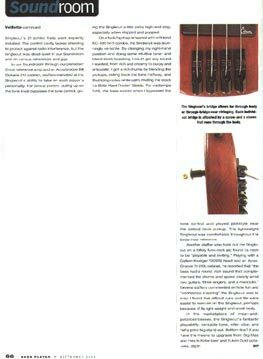 In my lap, the Singlecut's petite body was responsive and resonant, and I loved the interaction I felt with the bass, even acoustically. The inconspicuous but beautiful oil finish gave off a tasty vibe that one staffer referred to as "low bling boutique." The Innovative single-cutaway neck joint incorporates nuts and bolts rather than the more typical wood screws, and the slim, comfortable neck wouldn't budge. The Singlecut's 21 jumbo frets were expertly installed. The control cavity lacked shielding to protect against radio interference, but the Singlecut was dead quiet in our Soundroom and on various rehearsals and gigs. In our Soundroom through our Demeter/Crest reference amp and an AccuGroove Bill Dickens 212 cabinet, staffers marveled at the Singlecut's ability to take on each player's personality. For pickup purists, pulling up on the tone knob bypasses the tone control, giving the Singlecut a little extra high-end zing, especially when slapped and popped. On a funk/hip-hop rehearsal with a Roland KC-500 1x15 combo, the Singlecut was stunningly versatile. By changing my right-hand position and doing some intuitive tone- and blend-knob tweaking, I could get any sound I wanted, from rich and creamy to burpy and articulate. I got a rich thump by blending the pickups, rolling back the tone halfway, and thumbing notes while palm-muting the stock La Bella Hard Rockin' Steels. For midtempo funk, the bass sizzled when I bypassed the tone control and played pickstyle near the soloed neck pickup. The lightweight Singlecut was comfortable throughout the three-hour rehearsal. Another staffer who took out the Singlecut on a folksy funk-rock gig found its neck to be "playable and inviting." Playing with a Gallien-Krueger 1001RB head and an AccuGroove Tri 210L cabinet, he reported that "the bass had a round, rich sound that complemented the drums and spoke clearly amid two guitars, three singers, and a mandolin. Several staffers commented on how fun and "confidence-inspiring" the Singlecut was to play. I found that difficult runs and fills were easier to execute on the Singlecut, perhaps because of its light weight and small body. In the marketplace of meat-and potatoes basses, the Singlecut's fantastic playability, versatile tone, killer vibe, and hefty price tag stand out. Bottom line? If you have the means to upgrade from Big Mac and fries to Kobe beef and Yukon Gold potatoes, dig in!